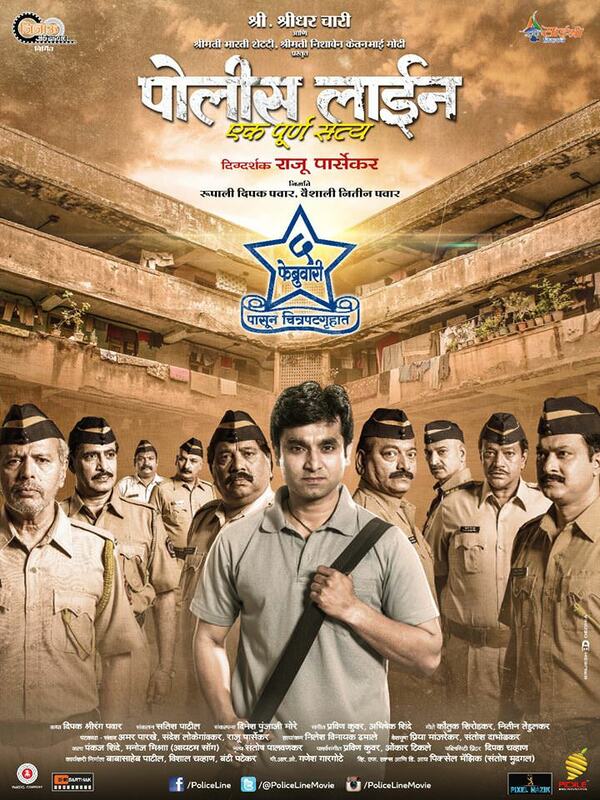 "Police Line-Ek Purna Satya (पोलीस लाईन:एक पूर्ण सत्य)" is a film based on lives of policemen when they are on and off duty. when common people are enjoying special occasion and festivals with there loved and dear one's these special people are on duty to protect us from mishappening. It is a story of them and there family, It is a story of there hardship which they have to go through. Film story is written by 'Dipak Shrirang Pawar' and directed by 'Raju Parsekar', "Jijau Creation" Rupali Dipak Pawar and Vaishali Nitin Pawar has produced the film, Its music is composed by Pravin Kunwar and Abhishek Shinde while lyrics is written by Kautuk Shirodkar and Nitin Tendulkar. Film has huge star cast as follow Santosh Juvekar, Jayant Savarkar, Manasi Naik, Satish Pulekar, Pradeep Patwardhan, Vijay kadam, Pradeep kabre, Pramod Pawar, Jaywant Wadkar, Nisha Parulekar, Nutan Jayant, Swapnil Rajshekhar, Purnima Ahire kende, Pranav Raorane, Sharmila Baviskar, Sayali Sanjeev, Satish Pulekar, Satish Salagare, Jaywant Patekar, Manoj Takne, Balkrushna Shinde, Atul Sanas, Riyaaz Mulani, Sandesh Lokegaonkar, Sheetal Kalapure, Ashwini Surpur, Leena Palekar, Aarti Kulkarni, Dinesh More, Umesh Bolke, Parth Ghorpade and Yuvraj More. Movie is slated to release on 5th February 2016.